First Capital Trolley is sponsoring a ‘Concert in the Park’ Friday evening, October 12, 6:00 to 11:00 benefiting Stuff the Bus Oklahoma 2012. Mineral Wells Park is the concert site located south of downtown Guthrie on Division Street. Admission is $5 per person. “All proceeds and items collected will benefit Operation Homefront Oklahoma, a Lawton-based, statewide non-profit. OHOK provides “emergency financial and other assistance to Oklahoma military families and to our wounded warriors when they return home.” Carol Herrick, Oklahoma chapter president, stated. 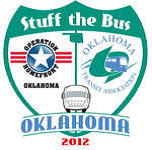 Stuff the Bus Oklahoma is an Oklahoma Transit Association initiative which supports OHOK. First Capital Trolley joins other transit systems across the state supporting OHOK. OTA is a non-profit with membership composed of public and tribal transit systems. “Stuff the Bus Oklahoma is just one more way transit systems support our veterans and our military. For many veterans, public transit is their lone connection to the outside world for transportation to not only medical care but shopping, entertainment and social activities,” Melissa Fesler, FCT director, stated. Holiday toys for kids books for children of all ages. Any sports item or equipment related to: football, basketball, soccer, baseball, tennis, golf. New clothing to include winter items hats, mittens, scarves, coats. OHOK provides financial grants, food assistance and quality morale programs; such as a statewide baby shower, back packs for military families and holiday assistance programs for junior enlisted service members. One Response to "First Capital Trolley sponsors concert to benefit Stuff The Bus Oklahoma 2012"
If this is a concert, some information about the music would be appreciated.